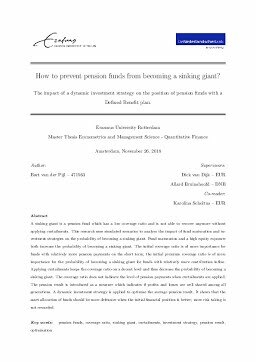 Erasmus University Thesis Repository: How to prevent pension funds from becoming a sinking giant? How to prevent pension funds from becoming a sinking giant? A sinking giant is a pension fund which has a low coverage ratio and is not able to recover anymore without applying curtailments. This research uses simulated scenarios to analyse the impact of fund maturation and investment strategies on the probability of becoming a sinking giant. Fund maturation and a high equity exposure both increase the probability of becoming a sinking giant. The initial coverage ratio is of more importance for funds with relatively more pension payments on the short term; the initial premium coverage ratio is of more importance for the probability of becoming a sinking giant for funds with relatively more contribution inflow. Applying curtailments keeps the coverage ratio on a decent level and thus decrease the probability of becoming a sinking giant. The coverage ratio does not indicate the level of pension payments when curtailments are applied. The pension result is introduced as a measure which indicates if profits and losses are well shared among all generations. A dynamic investment strategy is applied to optimise the average pension result. It shows that the asset allocation of funds should be more defensive when the initial financial position is better; more risk taking is not rewarded.